At 17, Ariel Spiegelman has already claimed several life-changing victories. And it’s not just her own life she’s changing. 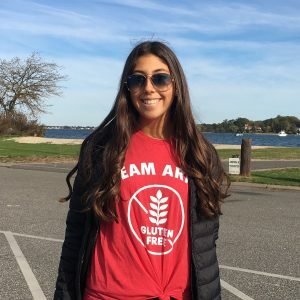 Raising awareness and an estimated $15,000 through the Celiac Disease Foundation’s (CDF’s) Annual New York Turkey Trot, a 5K run, she’s been named the 2018 Volunteer of the Year by the CDF. After being diagnosed with celiac two years ago, she felt it was important to help build the supportive community she would need. “I wanted to do something to help find a cure and increase awareness for the disease, not just for myself but for everyone else struggling with it,” the Long Island, New York, teenager says. When a person with celiac eats gluten, it damages the small intestine. For Spiegelman, just receiving a diagnosis was the first of her victories. She had struggled for seven months with an array of what she eventually learned were atypical symptoms—before her mom helped sleuth the answer. Spiegelman’s pediatrician had performed a variety of tests, checking her eyes, ears and blood, but had not mentioned the one condition her mother’s research brought to light: celiac, which affects 1 in 100 people. Her chief ailments included exhaustion, headaches and dizziness. “That was the main thing that was off—I had no stomach symptoms,” she says. Spiegelman’s doctor thought celiac unlikely since she wasn’t suffering the telltale gastrointestinal distress but decided to test for it anyway. Her mom’s hunch was confirmed. Left untreated, celiac can cause serious damage, ranging from lactose intolerance, anemia and early onset osteoporosis to infertility and nervous system and neurological disorders. It can even lead to other autoimmune disorders, like type 1 diabetes and multiple sclerosis. The good news: Diet modification would do the trick. Though monitoring her foods for gluten—a protein found in grains that helps foods keep their shape—could be taxing, Spiegelman could achieve relief without further medical intervention. When she finally had this information in hand, she didn’t waste any time making the changes—and getting involved. Spiegelman began researching the condition and the appropriate diet. She found online forums, Facebook groups and the Celiac Disease Foundation. Two months later, she took part in its Turkey Trot. Her friends and family have been supportive, helping with research and fundraising. She receives texts from friends whenever they discover gluten-free products at the supermarket. Spiegelman is careful about her diet now, studying menus and using apps to guide her. She’s even continued cooking and baking, but now with gluten-free ingredients, and for a good cause. In fact, she recently cooked a full gluten-free meal for 70 to 80 residents at the Ronald McDonald House. Find more information on celiac disease and the gluten-free diet in our Kids section!